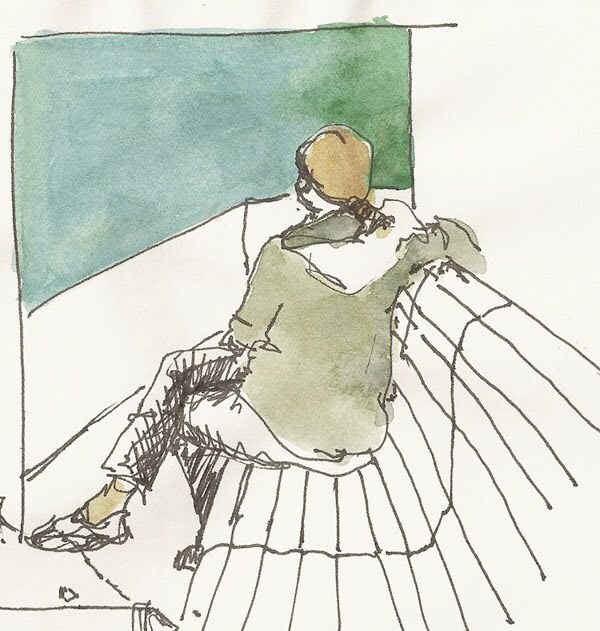 In my 45 years in the Northwest I'd only been to Bainbridge Island once, and never to the downtown, so it was a delightful reunion with Urban Sketchers Seattle...great company and conversation (and pretty good wine as well). Scale is still a challenge for me -- notice I had to work "above the fold" to get the steeple in. Did anyone get the name of this church? Did this on the way home on the ferry. Thanks for posting these great sketches. It is Eagle Harbor Congregational Church. Love these sketches. How pretty these both are. 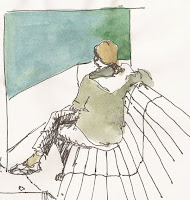 The person on the ferry really captures the pleasure of ferry riding. Love how you evoke the atmosphere! Scale is over-rated, these are great! I really like the concept of choosing not to color certain areas.